Effectively managing your time online, monitoring results and sharing content with your most relevant audience is important. Simply providing the best content is not enough if your target audience doesn’t get to see it! When we travel to foreign countries we love to sample the local cuisine. So here are 7 tips that are just a “taster” for what is coming up in my session at TBEX. I will share so many valuable and actionable tips that will help your business and I am so looking forward to meeting you all. There is a great session on photography that I’m looking forward to at TBEX, which is about ‘Telling your Travel Stories through Photography’ by Lola Akinmade Åkerström. Pictures are so important online and by just having a picture in a post you will get 94% more views! So unless you consider Google when uploading your images you could be losing out on relevant traffic. Image Name – The name of the image should include relevant keywords that you want to rank on within Google. Image Size – If you have too many large images on a web page Google will penalize you if it takes too long to download. So don’t upload large images unless there is a very good reason to. Alt Tag – The alt tag is what Google reads to find out how to index this image, so again, include relevant keywords. Caption – Always write a good caption with the picture, it will help the viewer to understand the context of the image, they will stay longer on your page and will be more likely to share. In Google Analytics you can set up goals that can track how successful your site is at getting visitor’s to take certain actions. For example, you could set up a goal related to visitors subscribing for a travel guide and then monitor how well your site is performing against that goal. If you’re not measuring your results online then you are less inclined to try and improve on them! There are different methods for measuring whether your goal has been achieved or not. For example, the goal could be achieved when a visitor lands on a thank-you page, which is only displayed after they have subscribed for your travel guide. This way you know this goal has been achieved. Goals are really essential to set up and track so you are more focused on the results your content is generating. When you find lots of great content you naturally want to share it out but it doesn’t make sense to share it all out at the same time. You may want to spread out the sharing of this content over a day or multiple days. This is where Buffer helps. 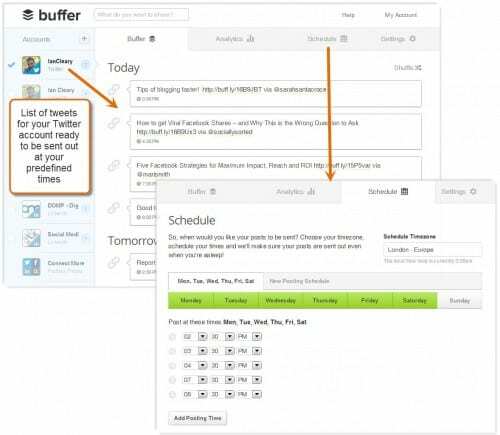 When you install Buffer you set up the times you want content shared and the social networks where you want it shared to. You then add a ‘buffer’ button to your browser. As you come across great content you click the Buffer button and it gets added to the queue. The content will then automatically be sent out at the next time you specified. Figure 2 Buffer is easy to set up and a pleasure to use! So if you’re not at your computer all day and you like sharing out content to your friends or followers, Buffer is a really useful app. When you perform a search on Google and see a picture of a person in the search results this is normally achieved using Google Authorship. This is Google associating the content with a real person. In order to develop a profile as a writer this is extremely important to set up. The best way of setting this up is creating a Google+ profile and within this profile you specify the websites where you publish content, such as, your own site or blogs where you guest post. The process of linking your content to your profile is called Google Authorship. It’s really important to monitor what is being said about you, your business or even your competitors online. However, one of the issues is that the tools can be quite expensive. While you could of course use Google Alerts, the problem is there is no way to effectively manage the follow-on activity that results from any of the alerts. Mention is a social media monitoring tool that monitors your keywords across Facebook, Twitter, Blogs, Websites and much more and provides a really nice user interface that is available on both the web and mobile devices. 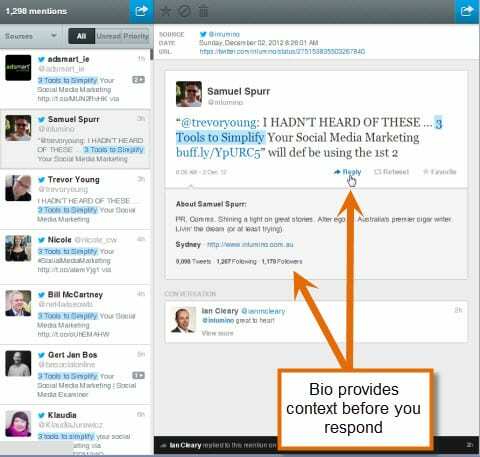 But what makes Mention stand out is the ability to view the source of the mention within the interface and then take action, whether that means responding to a tweet, a comment on a blog, or even assigning the follow-up to someone else. It has both a free option and a very affordable $20 per month option, so at that cost level it’s certainly an app worth investigating. If a Facebook page is important to your business then PostPlanner is a great tool that will help you deliver regular content, on time to help build an engaged community. As we all know sharing content is not always about sharing your own content. 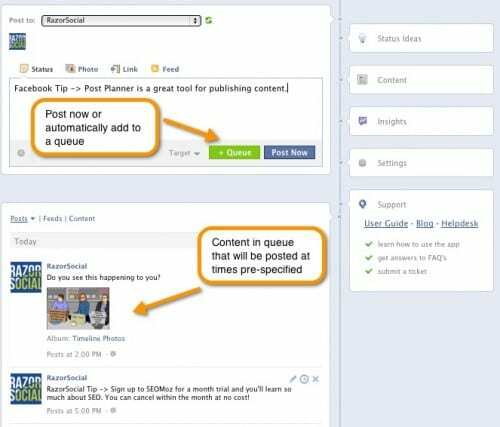 PostPlanner gives you great functionality to easily add in content from other blogs/Facebook pages. 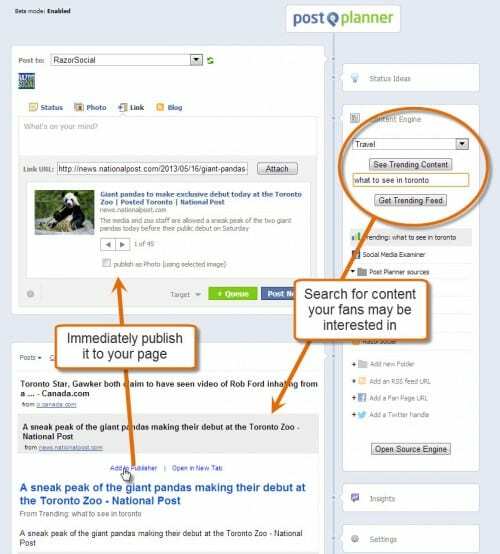 This can either be content from predefined blogs/pages you trust and like or it can be from the library of content delivered by PostPlanner. Figure 6 If you’re stuck for content ideas PostPlanner will give you some ideas! 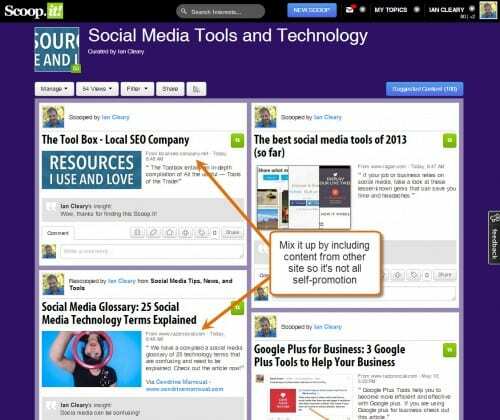 Although Scoop.it is great for finding content to share it’s also great for sharing content and bringing relevant traffic back to your site. On Scoop.it you can create one or more virtual boards based on topics of interest. When you find content you want to share, you simply add it to the relevant board. People can then follow and track your board, click on the links to come back to your website or share content on their own boards. If you like these tips and want a lot more please come along to my session. I will be around for a few days so even if you can’t make it make sure to say hello and I’ll help in any way I can. Are these tips useful to you? There’s still time to register for TBEX Toronto to hear more tips like these! About the Author: Ian Cleary is an entrepreneur, award winning blogger, speaker and digital marketer. He is founder of RazorSocial which is an award winning blog specialising in social media tools and technology. Ian also writes for social media examiner and other leading social media blogs. Ian has worked extensively in the Tourism Industry through his Digital Agency in Ireland. He’ll be presenting a session called Building Your Audience with Social Media Management Tools at TBEX Toronto. This is indeed very good information on how to get traffic to your blog site. Scoop.it is quite good but make sure you post other people’s content too. Thanks for the preview, Ian. It’s very helpful to have a more in depth idea about what a specific talk will be about than just the title alone. I checked PostPlanner, but it doesn’t allows to share content on my pages. Do I need to be an “expert” to do that? Wow. More tools that I have to research and start using. This is a great post lots of awesome tips! Thanks eh! That is great to hear. Thank you so much for your feedback. See you at TBEX! I’m using Adobe Lightroom in order to manage photo names, titles and meta tags.